1. Wilder, Farris It's All Your Fault Hi-Q (Mich.) 11 1957/Dec. 4. Terrigan Brothers Hi Ho Little Girl Fortune (Mich.) 207 1958/Dec. 5. De Bree, Peter Long Tall You [!!] 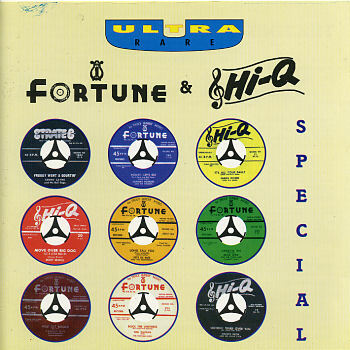 (From Louisville) Fortune (Mich.) 200 1958/Jan. 7. Powers, Johnny Honey Let's Go (To A Rock And Roll Show) Fortune (Mich.) 199 1957/Aug. 8. Bernell, Bobby Move Over Big Dog (Let A Little Dog In) Hi-Q (Mich.) 20 1964/Jan. 9. Frog, Shorty Sheddin' Tears Over You Hi-Q (Mich.) 12 1958/Jan. 10. De Bree, Peter Hey, Mr. Presley Fortune (Mich.) 200 1958/Jan. 12. Lynn, Patti Same Old Blues Hi-Q (Mich.) 23 1964/Feb. 20. Terrigan Brothers Little Love Fortune (Mich.) 207 1958/Dec. 24. Powers, Johnny Your Love Fortune (Mich.) 199 1957/Aug. 25. Hunt Sisters I'm Not Gonna Take It Anymore Fortune (Mich.) 213 1961/Mar. 29. Frog, Shorty I'm Glad We Didn't Say Goodbye Hi-Q (Mich.) 12 1958/Jan.